I have been asked by friends time and again how do I manage to juggle everything in life? Let me quote one of my friend's private message, "boy how do u juggle all of these? mom of 2 kids, a wife to mon, a nice job, time to blog, time for ur self! i admire ur passion in life keep it up "
I am not claiming I have a well-balanced life. I just do my best to live everyday as if there's no tomorrow. Let me give you a rough idea how my typical day was like. Yesterday, I had the privilege to work on half day. I met hubby for a spur of the moment lunchdate before I headed home and transform from a career woman to a supermom. Once I am home, the nanny doesn't touch Baby Gian unless I ask for her help. I fed Baby Gian his fruity snacks, changed his soiled diaper, and put him to sleep. 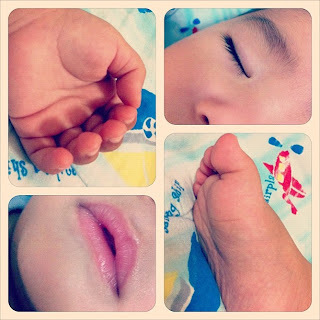 So, what did I do when Baby Gian took a nap? I kept myself busy with Instagram and my newly found fantastic free iPhone app called Frametastic since Kyla was still in school and I can't leave Baby Gian sleeping alone on the master bed. At his age, it is too dangerous. Hubby and I have instructed the nanny strictly to let him sleep on his playpen when we are not around. Better safe than sorry. KYLA: "Have you gone home to see Baby Gian mommy? Why are you still carrying your bag?" ME: "Not yet, sweetheart. I wanted to surprise you. You know that I love you and Baby Gian equally, right?" KYLA: "Of course I know mommy. It's fine with me if you go home first to check on my baby brother. He needs you more." On days that I am privileged to report in the clinic a bit later, I still manage to bathe Baby Gian before heading to work while the hubby brings Kyla to school. On days that I have to spend time with the hubby alone, I would fetch him at the train station and dine with him outside while the kids are already sleeping. This is how I make the most of my every day life. I agree with you wholeheartedly. I often think that the best way to live is intentionally, to try to capture every moment of life, thankful for the breathe in our bodies, the exeperiences we have, the chance to communicate with each other, the opportunities. There is so much to be thankful for, so much to be grateful for, and I love it. Happy Tuesday. I really like your collage of pics, it looks fantastic. I love how you manage your time to live life to the fullest, Che. Kyla is such a sweeet girl, understanding of everything. Whew ! I am already exhausted trying to imagine how you juggle your many roles. This is the thing I learn in my own busy life ... " when you love what you do, you will never feel tired". Keep loving and living life to the fullest. You are so wonderful and amazing in all that you do !!! It sounds like you are doing a great job of balancing. Life is crazy! : ) Keep up the good work! One day at a time and living it to the fullest is what I've done most of my life and I surely have no regrets. You have such a sweet, lovely family and a wonderful life and I'm so glad that you enjoy it to the fullest as well! Hope your week is going well, Cher! You sound like a dedicated wife and mom and a very organized one. Lovely post. I would love for you to visit me at My Dream Canvas :-) You have a lovely blog.